No doubt, Grammarly is the best tool to write error-free and pristine contents. It works pretty well for students, writers, and bloggers. But if you don’t like Grammarly (maybe because of high monthly fees) and looking for similar spelling and grammar checker tools, here in this blog post, I will share best Grammarly alternatives including some free ones. Being human, we all make common and complex mistakes even professionals can do. Writing can be a nerve-wracking task, not only for non-native but also for native English speakers to some extent. Like people say, three eyes are better than two. So, it’s always a right approach to have a proofreader tool that scans all of your contents and detect grammatical errors. Now, let’s cut the crap and just talk about the best alternative apps like Grammarly. ProWritingAid is a top-notch and popular alternative to Grammarly in the market for premium quality. It’s a well-designed tool for maximum usability and provides ease of use. It contains feature similar to Grammarly but at comparatively lower rates. There are free and premium versions available to use but of course, paid versions comes with advanced checks and features. ProWritingAid can be used on Windows, Mac, Google Chrome, Google Docs, and Microsoft Word. Developers can make use of advanced API in their applications to take the most out of it. ProWritingAid check over 25+ types of grammar and syntax errors such as sentence structure, dialogue tags, pronoun, negations, writing style, etc. It points out grammar, punctuation, overused words and other grammar errors within seconds. But their spelling checking is not much efficient. I’ve used both ProWritingAid and Grammarly to check misspelled words, but only Grammarly underlined it and suggested correct word. However, other features still work quite well such as structure and style enhancement. You can check 7 different types of documents such as web, business, creative, technical, etc. Different writers can have a different writing style, so this allows everyone to scan their content and documents through an appropriate option to improve their stuff. With all that, you also can choose the UK, US, and general English as each has different grammar rules. Another thing you must know is that its extension only available for Google Chrome browser. So, the users who use Firefox, Opera, etc. will need to install either Chrome or desktop app which is only available for paid clients. However, the Chrome extension (free) is very impressive and easy to use. The users can find and correct mistakes while writing on Facebook, Email or WordPress editor. When installed in the browser, it appears in the left bottom same as Grammarly app. You just have to hover over it and select what mistakes you want to address in the syntax. The best thing about browser extension is its word explorer feature that provides in-depth details, thesaurus, common phases, examples from books and quotes, and a lot of other stuff. It also presents a complete report of your document including commonly used words, number of mistakes, grammar mistakes, content readability, and other errors. The only drawback (which I think not a big deal) of ProWritingAid is lack of mobile application availability whereas Grammarly also supports Android and iOS. Regarding prices, it’s cheap, but mobile support is essential for writers and novelist as anything at any place can give them new ideas. So, they may need proofreader at that time. Besides this, ProWiringAid is one of the most comprehensive and all-in-one alternative to Grammarly. The premium plans start from $60 per year to $120 for three years, you can save a lot of money by picking a long term contract. The company also offer a lifetime plan which costs a single time fee of just $210. Compared to Grammarly pricing, ProWritingAid is way cheaper yet affordable for anyone who creates content regularly. WhiteSmoke is another Grammarly alternative with almost similar features. It addresses critical correction and suggestion compared to other proofreading tools. It can detect spelling, grammar, sentence style and punctuation with high precision. Thousands of users around the world using WhiteSmoke including students, business owners, writers, individuals, and professional novelists to proofread their writing and thus perfect them. Checking your emails, blog posts, or business proposals through WhiteSmoke’s advanced algorithm will not only help you fix common but also complex mistakes to avoid embarrassment. In term of accuracy, it wasn’t that efficient in the past, but the recent update changed the whole story. 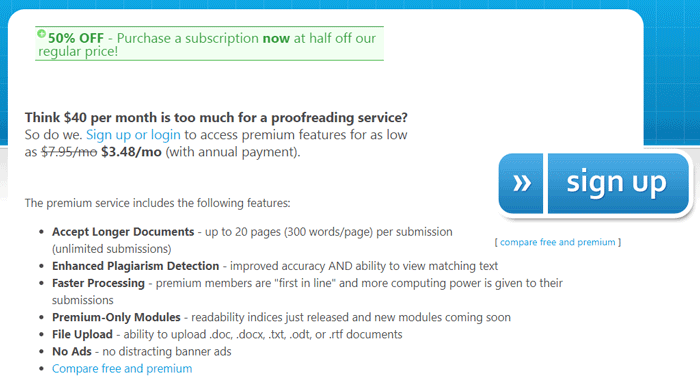 Now, it provides more accurate and advanced proofreading results. Every grammar checker offers spelling, grammar, and punctuation checking as a standard feature but this one also suggests sentence style and useful words for your phrases. Futhermore, it explains why to use the suggested word with examples and detailed explanations similar to Grammarly. While writing in White Smoke, you can find enrich words and error explanation of words by right-clicking on it. This program is capable enough to point out more than 16 grammatical and syntax errors such as double negation, fragment, adjective, subject-verb, styles, etc. within seconds ignore by human eyes. It highlights the problematic words with green, red, and blue lines where green indicates grammar error, red as misspelled words, and blue as punctuation mistakes. So, these color variations come handly to address the flaws and correct them quickly. Do you want to improve your english vocabulary? Well, it provides an up-to-date dictionary and thesaurus feature as well. While reading online, right click on the unfamiliar word and it will display a box with explanations as well a ton of synonyms of that word. One of the most exceptional features is language translation which can translate to and from 55 different languages. It is not available in Grammarly. The translator is built on Statistical Machine Translation (SMT) technology along with linguistic experts, millions of analyzed texts, and Whitesmoke computers to render the highly accurate and related translation to the source. They are continuously working on this to enhance the performance at its best and one of the most advanced technologies today. It checks your text by comparing and analyzing with millions of professionally translated texts and expert linguistic from its database. Just like the competition, it also comes with a plagiarism checker to help writers, freelancers, and bloggers examine the authenticity of their contents. They have a broad range of intensive video tutorials related to grammar and sentence writing, etc. for users self-education. Right now, available for popular browsers such as Chrome, Opera, Safari, Firefox, and Internet Explorer. Besides that, you can also take the most out of it by installing Windows, Mac OS, Microsoft Office, and Android applications. So, it covers a wide range of devices and operating systems for ease of use rather than sticking with a single channel. There are three plans available to choose from: Monthly ($9.95/mo), Annually ($6.66/mo), and Triennially ($4.44/mo). When we compare Grammarly and ProWritingAid with WhiteSmoke, their approach to paid plans is a bit different. They provide three different packages named Essential, Premium, and Business where each package come with different features. For instance; you cannot integrate the “Essential” with Gmail, MS Office, and macOS. On the other hand, it also not include instant proofreading and multi-computer licensing. Furthermore, WhiteSmoke’s iOS and Andriod app cost an additional $1 per month which is weird. This logic is out of my mind because the competition is offering such features at no cost. I’d like to prefer picking the “Premium” account instead of the most basic “Essential” because of advanced features and compatibility with all writing platforms. Ginger is one of the leading proofreading tools and Grammarly alternative to craft flawless contents. Ginger’s proofreader offers unique specialties for writing and spoken English improvement which impressed me to include it in this list. Same as the above tools, this one also available in free and premium versions. Of course, there are some limitations in the free version. It can be installed in web browsers, Windows, Mac OS, and Android devices. Ginger pretty actively highlights mistakes while writing and suggest suitable solutions. Ginger grammar software provides very high accuracy regarding spelling, punctuation and grammar correction. This tool uses an advanced patent-pending technology that points out blunders and efficiently corrects texts based on the whole sentence. All you have to do is point your mouse over the highlighted words and choose the perfect suggested word from the pop up box. With browser extensions, you can craft great looking copies no matter if it’s WordPress editor or blogs commenting. Plus, it makes communication between foreigners quite easily by modern language translator that covers 40 languages and can convert to any required one. It enables translating into English, Spanish, Italian, French, German, and Japanese, are few names. Best thing is this feature is entirely free and available for all. Unfortunately, they do not offer plagiarism feature like Grammarly which might be a major deal breaker. More precisely, bloggers and writers who frequently analyze their content to avoid content duplication may find it worthless. Whereas, sentence rephraser and text speaker are astonishing and compelling. Rephraser suggests an alternative sentence (having the same meaning) of the selected one just like Grammarly. This feature can add extra magic to your sentences by combining the most efficient and meaningful words. It helps to simplify the phrase without spoiling the actual meaning thus deliver your message efficiently. Only a single click will rephrase the entire text in a comprehensive format, adds missing words, complete fragmented lines, and fix spellings as well. “Text to speech” is another advantageous feature for spoken English enhancement. Native and non-native speakers can listen to own writing or other’s content for improving speaking skill. You can increase/decrease the speech speed, control volume, and choose from a male and female voice. Futhermore, it highlights the reading words for better comprehension. The text reading functionality is enhanced with spelling and grammar checker tool so that it fixes all the possible issues on the go. When it comes to proofreading, they have an outstanding dictionary which is free of cost. It helps the users understand any selected words with full explanation and pronunciation. Ginger also offer personal trainer where you can practice English which analyzes your weak area and provides necessary lessons to improve that weakness. Ginger grammar checker also has three plans to offer; you can either pick a monthly subscription, quarterly or yearly plan. Just like Grammarly, Ginger doesn’t impose any restriction based on the package you choose as all of them holds all features. On a monthly basis, the price is $8.96 whereas annual plan cost $3.74/month with 70% ongoing discount along with 7-days money back guarantee. Tired of signing up before proofreading or checking grammar errors from your writing? Well, PaperRater doesn’t require registration before using as it directly analyzes the content through Artificial Intelligence and data science in real time. It takes only a few seconds and points out the mistakes. Their algorithm is based on cloud servers and can be used anywhere anytime for finding and fixing grammar, punctuation, spelling, sentence structure, and proofreading. 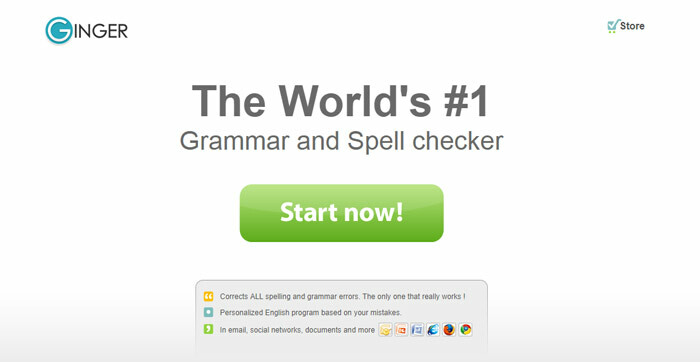 This online grammar and spelling checker also automatically grade your syntax by considering multiple factors. In that way, you’ll be aware that which kind of audience can easily read your articles/blogs. When you type text, its AI Engine starts working right away and not only check for grammatical errors but also sentence structure as well as suggest helpful tips to make them even better. So, how they score the syntax? Well, PaperRater incorporated Grendel AI for assigning grades which help students get a better grade from their teacher. Bloggers and writers can use this feature to craft easy to read and coherent content. So, what makes PaperRater a better Grammarly alternative? Probably, it’s free, require no signup, offer free plagiarism checking, and much more. When it comes to the PC application, you can install it on your computer and the software also works with MS Office. While using Microsoft Office, it checks each line step by step and points mistakes and suggestions for correction. This ease of use is one of the elements that’s why thousands of students around the world from 140 countries using PaperRater daily. Furthermore, the tool also examines texts to compare with other students on the same academic level regarding readability stats, passive voice detection, phrases to avoid, phrases length, variability, and sentence beginnings, etc. It’s quite useful to identify if you’re equal or better than other peoples in the same education level – best for students. Premium plans come with advanced features and is optional as you can always take benefits from the free version but with limited access. Vocabulary builder, personal dictionary, text translation between various languages, etc. are other noteworthy features. As mentioned before it’s entirely FREE but restricted to advanced functionalities including enhanced plagiarism monitoring, file upload, faster processing, plagiarism integration with proofreading, etc. This free Grammarly alternative also allows limited 50 submissions and 10 plagiarism checker monthly. So, if you want to get them, you’ll have to subscribe Premium plan which costs $7.48/month and cheaper than Grammarly. They are running a special promotion of 50% discount right now. So, it’s the right time to grab your premium account. Hurry Up! Besides their free offering, PaperRater.com also provide premium service which comes at $3.48/mo when you choose to pay a single annual payment. As a paid user, you can submit longer documents, better plagiarism checker, ads-free experience, and faster processing. Currently, they are running a 50% off promotion, so it’s a good time to save some bucks. 1Checker is a free alternative to Grammarly to craft perfect articles and assignments. The tool offers both versions online and desktop software for Windows and Mac machines as well as MS Office add-on also available. But, to make use if it, you’ll have to register first. It takes only a few seconds to analyze and proofread your content through the advanced artificial intelligence engine and detect spelling, grammar, and sentence style issues. The best part is 1Checker is entirely free, they don’t offer any premium plans but still deliver impressive results. This online grammar and proofreader platform empowered by contextual learning (CL) technology and suggest better phrases or words placement for comprehensive and unique writing. So, it helps users avoid using useless words and make sentences readable without spoiling the actual meanings. It records the complete history of users data and insights of all the checked documents and syntax. So, they can diagnose which part they should more focus to enhance skills. All mistakes are provided by a detailed explanation to help understand what’s wrong and why. You can use the preferred method either online or software client, type, paste or upload your documents and press the “Review” button. It will take a few moments to review for all the mistakes, explanations, and suggestions. First of all, it shows you a complete summary where everything can be checked including structure, vocabulary, word counts, and average length, etc. Close it and head back to the editor where under each wrong or misused words 1Checker suggest right phrases. You can correct one by one or simply click on “Apply all” button for a quick fix. When you click on the highlighted words, you’ll see a full list of right words along with descriptions in the right sidebar of the software. Just choose the correct phrase for polished and professional looking articles. Furthermore, there are a bunch of pre-made document templates available for businesses, communications, and study fields. It’s an absolutely free tool. I hope above checkers are enough for all users to find the great tool but if you’re out of money, searching an entirely free grammatical error detector (though 1Checker costs nothing), then keep reading. Below mentioned tools won’t require the premium subscription and work pretty the. It’s a simplistic Grammarly alternative that scans for spelling, grammar, and punctuation with explanations when you hover the cursor on the highlighted words. SpellCheckPlus also present a grammar score and word counts along with copy/paste, search, and printing options. Type or paste your articles into the editor and press “Check Text” button, shortly it’ll bring up all the possible fluffs. SlickWrite is also an online free grammar checker that doesn’t require downloading and installing the user client. It’s a web-based platform where you can type, paste, and save content to the local computer after completing the post. It checks for sentence length, estimates reading time, uncommon and transition words, redundant phrases, passive voice, adverbs, and readability. The working principle is quite similar than the above one as double-clicking on any phrase will help you check citation/details through Urdu Dictionary, Wikipedia, Google, Thesaurus, and Associated Words, etc. Last but not least on our list is Typely. Free online editor and proofreader that helps bloggers, writers, newspaper, teacher, and students to proofread their contents. It’s a reliable and unobtrusive tool that scans thoroughly and analyzes for spellings promptly. Typely provides a complete summary including characters count, reading time, eleventh grade, vocabulary, reading difficulty, and sentiment analysis of the entered text. Apart from that, PDF file converting or export to Google Docs also available. Plus, “Read it to me” is another mentionable feature for listening to your selected text. Now, it’s your turn to choose the most suitable Grammarly alternative for your blog and content writing projects. You can pick the perfect tool either free or paid. However, I recommend ProWritingAid because it’s the only tool which is closely relevant to Grammarly in term of functionalities and features.